The first round of the 2018 French Open is almost complete with just one match outstanding – the world number one, Simona Halep and Alison Riske were scheduled for Philippe Chatrier but never got on court and will play first thing on Wednesday. It was an eventful day with my three top matches from the first round all on the schedule, plus the return of Serena and Maria at RG. This post features the matches that I was able to watch on Tuesday. Read on for seven stories. The most enticing match-up from the slate of first rounders was undoubtedly the battle of former French Open champions between Garbiñe Muguruza and Svetlana Kuznetsova. 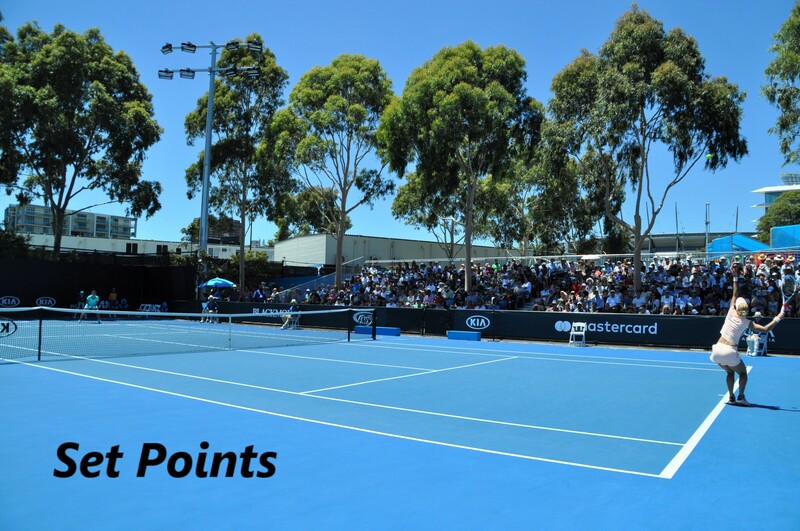 Sadly it only warranted Court 1, the third of the show courts – a treat for fan with tickets for this court! The match lived up to expectation with Muguruza beating Kuznetsova in an entertaining encounter, 7-6(0) 6-2. The match was halted at 5-5 in the first set for the rain with Muguruza failing to serving it out at *5-4. I started watching from 5-5 where Muguruza eventually ran away with the set with a tiebagel. All in all, I was very impressed with Muguruza’s performance. The Spaniard has a habit of turning it on for the Slams and today was her best performance in a long, long while. I’ve always believed that Muguruza is at her best when she is coming forward and using the serve to set up the short ball to attack. The Spaniard can be erratic with her volleys but it’s the gameplan that has won her two Slam titles. A key stat in this match was that Muguruza won 23 out of 32 points at the net. Based on this performance, I think that Kuznetsova has still got plenty to give on the WTA tour. Sadly she was hosed by this draw. No doubt for me that Muguruza is a legitimate title contender. You just cannot judge her on pre-Slam form. Daria Gavrilova survived a nerve-jangling opener against Sorana Cirstea, coming from a set down to win, 4-6 7-6(4) 6-3. The Aussie just about did enough to throw Cirstea off her rhythm with loopy balls and her fair share of aggressive forehands. Cirstea had a chance to level up at 4-4 in the decider but didn’t take it, eventually falling away with a stream of unforced errors. Gavrilova gets Bernarda Pera in the second round – sounds interesting to me! The upset train nearly bundled Maria Sharapova on board as she went down 0-3 in the third set against Richel Hogenkamp. Sharapova survived, rolling through the last six straight games to win 6-1 4-6 6-3. Sharapova gave a really hearty handshake to Hogenkamp at the end, clearly acknowledging her fight. An excellent result for Sharapova considering she was teetering on the edge. I think Donna Vekic could be a tricky opponent in the second round. Kiki Bertens eased into the second round of Roland Garros with a 6-2 6-1 victory over Aryna Sabalenka. Bertens played a great match as she demonstrated her clay court prowess with some sterling defence. As well as Bertens played, Sabalenka was pretty poor. The Belarusian was notably unclutch as she went 0 for 6 on break point conversions. Bertens came up with a magnificent passing shot winner in the final game and looks a dark horse in this form. Serena Williams made a triumphant return to Slam action with a hard fought 7-6(4) 6-4 win over Kristyna Pliskova. I watched the end with my two nieces and was telling them all about Serena. The American, who was sporting a catsuit, looked impressive and her serve was key to the victory with 13 aces and 80% of first serve points won. Wednesday will see Halep-Riske take to the court along with the bottom half of second round matches. I’ll try and put up a few more thoughts on the matches on the separate page. Polls linked below for my three favourite match-ups. The first game was a long one as the bro held serve in what must have been five or six deuces. I managed to hit two return winners (one sweet forehand) but I didn’t take my chances. Before I knew it, I was down 0-4! I managed to get two games, both breaks of serve and hard fought, but the bro powered home to take the first set, 6-2. He was able to dictate with his forehand and I felt powerless. I was definitely feeling slow and fatigued after playing yesterday. I improved in the second set and started to play with better tactics, targeting the bro’s weaker backhand side with height. I got an early break but that didn’t last! I spent a lot of energy battling my emotions. There’s pride at stake against the bro. I’m eight years younger and have spent most of my life losing to him at various different sports 😂. I can totally understand when the players lose it on court. It’s so hard to put disappointment behind you and to stop the scoreboard from rolling in the wrong direction. I found whacking balls at the back fence helped to get my anger out 😂. I lost my temper after the best point of the match when I was serving at *3-4 *30-15. We traded groundstrokes at the baseline and finished with some pinball at the net. Unsurprisingly I lost the point and soon the game as I dumped some forehands from promising positions into the net. My head was gone at this point and i’d tightened up. The bro saved a break point in the final game to win, 6-2 6-3. I was disappointed with the scoreline but it’s always going to be difficult as he’s simply better in every department. I think one of my biggest strengths is that i’m scrappy but against the bro it’s not good enough. I told myself to take some risks early on in the second set and it worked for a time but I just lost my way. My tactics were a bit off today and I need to try and stay focused. We may have a day off from playing a match tomorrow but i’m sure we’ll get at least one more match in before the end of the holiday! We’re having a great time. May 29, 2018 in Roland Garros, Set Points, WTA. Not too sure what to make of Serena. First of all, her serve was outstanding. She’s lacking hardly any power or accuracy. Her movement on the other hand looked initially really problematic. It did improve, as did her return and groundstrokes, as the match wore on, making me think it was nerves as opposed to lack of fitness. I don’t think she really has any designs to win this title. But if she gets a few wins under her belt, she may be a real contender at Wimbledon. Yes, clay does require some kind of rhythm, especially with movement. She did get going as the match wore on. I’m assuming it’s more a prep for later tournaments. Get that tennis feeling back. Personally don’t consider her a contender for any title right now( even wimbledon), just good to have her in the mix, playing decent tennis. Kristyna was more competitive in the second set, would love to see how Serena responds to the likes of Svitolina, Halep etc., even a Bertens whose game is well calibrated to the surface. Right now I wouldn’t fancy Serena’s chances on clay against a Svitolina or a Halep. Not even Sharapova. But with a couple matches and some more confidence, she could make it close. Her serve was really ON yesterday. And she hit some menacing groundstrokes & returns in the second set when she got into a bit of a rhythm. The Cib had the trainer work on her hip/back multiple times during the match. Possibly as a result of her 3:40 match with The Pav in Strasbourg 6-7,7-6,7-6. The trainers brought out a foam mat for her to lay on instead of just a towel on the ground, which I thought was a good move. Two stars playing each other in the first round, while two qualies play each other — bring on the 64 player draw. Possible upset tomorrow Sakkari over CSN. It’s funny because a commentator the other day (I think in the Djokovic match) was saying he’d like to see LESS seeds at Slams so that we could get even more blockbuster matches early on and get people more into the events. I know @Ziggy is against it, doesn’t protect the higher ranked players, but it is for a similar reason that’s why I find the WTA plans for a top 16 seeding very fascinating. Indeed, I think the current state of the tour is already creating such an effect because player rankings keep ‘yo-yo-ing’. If I recall correctly, they reckon it will improve the matches from rounds 1-3, waning in the 3rd. And the 5th – 7th will be about just what we used to. Keep in mind, I’ve generalized a bit. I agree there will be a few brutal results for some, but we’ll see. I personally think the yo yo of the wta makes the matchups in the first half of an event way more interesting than say the men’s, where you know the top seeds are coming through unscathed. Would you rather watch Rafa or Zverev play a nobody, or Halep play Sharapova? !